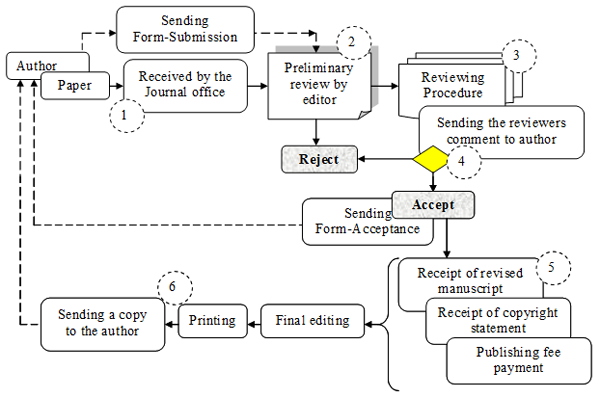 Once the initial review results are submitted to the authors, depending on the decision, the authors will be informed for the next steps. The final decision for publishing will be announced by sending Form for Acceptance (IJITS_Form-4_Acceptance.pdf). After a manuscript has been accepted for publishing, the author(s) will be approached with a request to pay a charge of 6 EUR (12 BGN) per page (VAT and postage are included). The payment of this charge is a prerequisite for publishing. The details for payment will be listed in the sent Form for Acceptance. After publishing, the corresponding author will receive a copy of the publication.